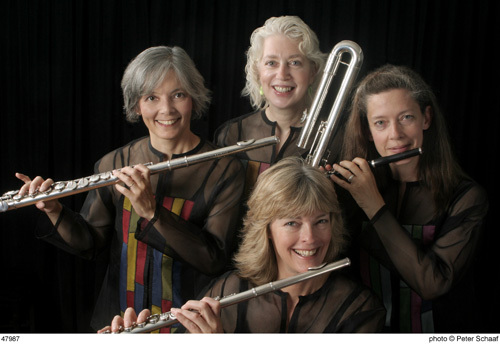 Flute Force is a flute quartet, perhaps the first professional flute quartet to have formed in the United States. Founded in 1981, Flute Force has maintained a presence on the chamber music scene offering innovative and varied programs with a dedication to virtuosic performances. They have mined the existing original literature, created their own transcriptions, and commissioned and premiered a substantial number of new works. Each member of Flute Force plays all the flutes of the flute family: the piccolo, flute, alto and bass flutes-sometimes in a single concert. Flute Force performs chamber music programs for all types of audiences and presents educational concerts and masterclasses for students of all levels. Recipients of grants from the National Endowment, Chamber Music America, the New York State Council on the Arts and Meet the Composer, the New York City based ensemble has been featured in venues throughout the United States and Canada as well as at the Australian Flute Festival in Melbourne, Australia.